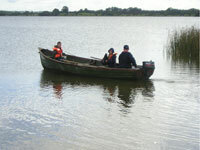 Within walking distance of Lough Ennell Caravan Park is Belvedere House and Gardens. This magnificent, newly restored estate is set in the midst of 160 acres of parkland on the lake shore. Attractions include extensive gardens, a splendid array of follies, The Historic Gardens, and the stunning surroundings of the park and lake setting. Activities such as discovery trails, guided walks, themed play areas and tram tours are available at the grounds and a visit is highly recommended. A short drive from the caravan park, Locke's Distillery in Kilbeggan is the oldest licensed pot still distillery in the world. Locke's produced triple distilled whiskey for nearly 200 years. Now open as a museum, guided tours follow the process from the grinding of the grain to the casking of the final product, with a complimentary sample of Kilbeggan Irish Whiskey at the end of the tour. Steeped in ancient Irish History and folklore, the Hill of Uisneach, five miles west of Lough Ennell, offers fascinating stories of days gone by. Uisneach is the sacred site of the ancient goddess, Eri, from which Ireland gets her name. The hill and surrounding land is regarded as the spiritual and physical centre of Ireland. ".. we were very impressed by all the things to do around Lough Ennell ... we had a great time"
".. thank you for a wonderful holiday ... loads to entertain the family"
".. we had a great time, Belveder House& gardens was magnificent"
".. your park is ideally located to to tour the midlands, thank you all for a lovely time"
" we were very surprised at how much there was to see and do in the mullingar area ... thanks again for a wonderful time"
"... everybody had a wonderful time ... thank you"
out fishing in the lake's renowned waters.